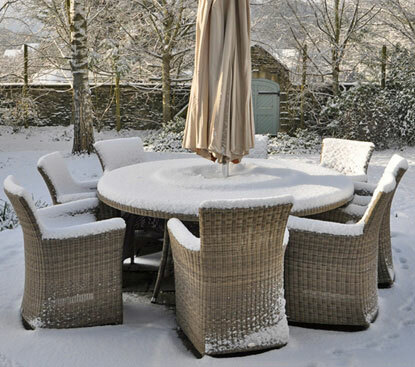 Where are you putting all your garden furniture this winter? We have again got to that time of year again when the woolly, scarves and gloves come out, the central heating comes on and the summer wear goes to the very back of the wardrobe to become a mere distant memory. But apart from your clothing, what else should we be putting on the back burner? Here at The Storage Centre we have made a list of the things to do to get ready for the next few months of rain, snow and plummeting temperatures. Unless you have been planning to open a small make shift ice skating rink in your back garden, now is the time has come for you to wave goodbye to the paddling pool as it goes to its home in storage or the garage to spend the duration of the winter season. It may well have brought day after day of enjoyment in the summer time but now with winter upon us its far more enjoyable to be inside with the central heating on and the feet up! You can forget the days when you can enjoy a nice cool glass of wine or an ice cold beer while heating up the BBQ and entertaining for close friends and family. It’s time to dust off your barbeque covers or open up your garages to put your hard working barbeque away for many months of rest. With this winter predicted to be colder and snowier than any previous recent winters there surly won’t be much need for your garden and patio furniture. So due to their seasonal nature it too will need to be packed away or covered along with the rest of the items reserved for those summer days and long laid back nights. It has probably been a very long time since the items in the attic saw the light of day but now is the time to get up there and bring down all your winter essentials. That means your electric heaters, electric blankets, water bottles and pretty much anything to help keep you warm and cosy over the next few months. Or how about some space to store your summer gear instead of it clogging up your garages and attics? Then visit us here at The Storage Centre facility, our website www.storagecentreni.co.uk to find out more about the storage services we can provide you.